MANILA -- Nothing but total failure. This was the description given by the military to the New People's Army (NPA), which will observe its 50th foundation anniversary Friday. 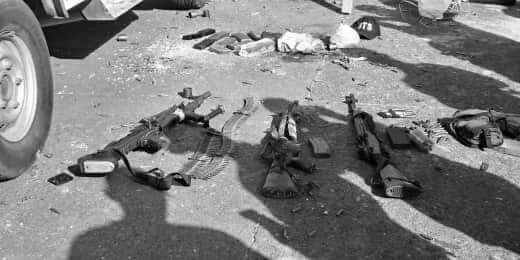 "The CPP (Communist Party of the Philippines)-NPA’s 50-year rebellion is an utter failure as it only resulted (in) loss of lives and destruction to properties. If there is anything significant to the CPP-NPA’s existence, it is the 50 years of violence, injustice, atrocities, deceit and lies. They continuously hinder peace and development in some areas of our country. The leaders, members, and supporters of the communist terrorist group should be ashamed of themselves for bringing years of hardships and misery to our people," said Armed Forces of the Philippines (AFP) public affairs office chief, Col. Noel Detoyato, in a message forwarded to the Philippine News Agency Thursday. The military official, meanwhile, called on Filipinos to help the government in putting an end to the decades-long violence of the communist movement. "Let us unite in encouraging our misled brothers and sisters in the CPP-NPA to end the armed struggle and embrace the path to peace," Detoyato said. He added that it is never late for rebel fighters and supporters, tired of their causeless fight, to return to their loved ones and families and live productive lives in mainstream society. "It is never too late for them to return to the fold of society and adhere to the rule of law. Our government has laid programs for rebels who wish to surrender such as the Enhanced Comprehensive Local Integration Program or E-CLIP to help them start their new lives as productive Filipinos," the AFP official said. The E-CLIP, which was institutionalized by President Rodrigo R Duterte on April 3, 2018, provides a complete package of assistance and interventions to former communist rebels and their immediate families to prepare them for integration to mainstream society. Meanwhile, the Department of National Defense (DND) said the five decades of the NPA's existence is a sad and unfortunate reminder of the Filipino people’s suffering. "For five long decades the NPA stained our soil with blood, extorted from our hard working people, harassed our communities, and tore Filipino families apart. The screams for justice by their countless victims are deafening, and the President has heard them all," the DND said in a statement. The agency also called on Filipinos to support the government’s efforts to eliminate the communist rebels from the land. "Let us show the world that the NPA and their ways of crime, violence and terror have no place in our homes, in our society, and in our country," it added. Around 11,000 NPA fighters and supporters have surrendered to government troops since January 2018. AFP deputy chief-of-staff for civil-military operations, Brig. Gen. Antonio Parlade, Jr., earlier said the government is ready to finally end the communist threat through Executive Order (EO) No. 70 signed by the President on Dec. 4, 2018. The EO created the National Task Force to End Local Communist Armed Conflict (NTF-ELCAC), chaired by the President, “to synchronize the utilization of the government's instrumentalities of power with the capabilities of private sector stakeholders to finally end the 50-year long deceit, lies and atrocities committed by the communist terrorists against the people”.